Stockings have long been one of my favorite Christmas traditions. Growing up (and up until this year) my dad's side of the family would gather at my grandparents house on Christmas Eve for dinner and again in the morning for breakfast and presents. The house has this really unique waist-height fireplace set into a brick wall in the kitchen, and below it we hung everyone's stocking—knit by hand by my great aunt Bernice. As the years went by, the weight of the stockings started to dwindle—but I refused to let the tradition dissolve completely. As the only grandchild on that side of the family, it's my duty! Just the sight of them hung (by the chimney with care) filled me with that warm Christmas-y feeling of nostalgia and love. This year will be the first Christmas I've spent not in that house in my entire life (which is nearly the case for my dad and his siblings, too). And while it will certainly be sad, keeping the tradition of the stockings alive is one way to keep those memories fresh for all of us. So, now that I've waxed sentimental about my holiday traditions—let's get to the gifts! This is another gift guide I created for Lifestyle Mirror, of stylish little stocking stuffers. 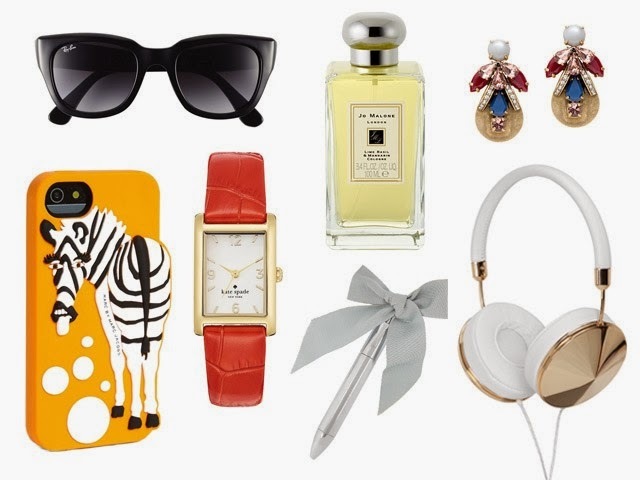 From my favorite Jo Malone scent (in travel candles and perfume) to a chic Kate Spade watch and cheeky Marc By Marc phone case—these are all sized to tuck right into a stocking and sure to please anyone on your list. Great ideas - that Zebra phone case is too cute - love it! love the headphones! i'm taking a solo trip soon and those would be perfect on the plane!